The Battle of Roncevaux Pass was part of Charlemagne's Iberian campaign of 778. The Basque ambush at Roncevaux Pass is believed to have taken place on August 15, 778. Following a meeting of his court at Paderborn in 777, Charlemagne was enticed into invading northern Spain by Sulaiman Ibn Yakzan Ibn al-Arabi, wali of Barcelona and Girona. This was further encouraged by al-Arabi's promise that the Upper March of Al Andalus would surrender quickly the Frankish army. Advancing south, Charlemagne entered Spain with two armies, one moving through the Pyrenees and another to the east passing through Catalonia. Traveling with the western army, Charlemagne quickly captured Pamplona and then proceeded on to the Upper March of Al Andalus' capital, Zaragoza. Charlemagne arrived at Zaragoza expecting to find the city's governor, Hussain Ibn Yahya al Ansari, friendly to the Frankish cause. This proved not to be case as al Ansari refused to yield the city. Facing a hostile city and not finding the country to be as hospitable as al-Arabi had promised, Charlemagne entered into negotiations with al Ansari. In return for the Frank's departure, Charlemagne was given a large sum of gold as well as several prisoners. While not ideal, this solution was acceptable as news had reached Charlemagne that Saxony was in revolt and he was needed to the north. Retracing its steps, Charlemagne's army marched back to Pamplona. While there, Charlemagne ordered the city's walls pulled down to prevent it from being used as a base for attacking his empire. This, along with his harsh treatment of the Basque people, turned the local inhabitants against him. On the evening of Saturday August 15, 778, while marching through Roncevaux Pass in the Pyrenees a large guerilla force of Basques sprung an ambush on the Frankish rearguard. Using their knowledge of the terrain, they decimated the Franks, plundered the baggage trains, and captured much of the gold received at Zaragoza. The soldiers of the rearguard fought valiantly, allowing the remainder of the army to escape. Among the casualties were several of Charlemagne's most important knights including Egginhard (Mayor of the Palace), Anselmus (Palatine Count), and Roland (Prefect of the March of Brittany). Though defeated in 778, Charlemagne's armies returned to Spain in the 780s and fought there until his death, slowly extending Frankish control south. From the captured territory, Charlemagne created the Marca Hispanica to serve as a buffer province between his empire and the Muslims to the south. 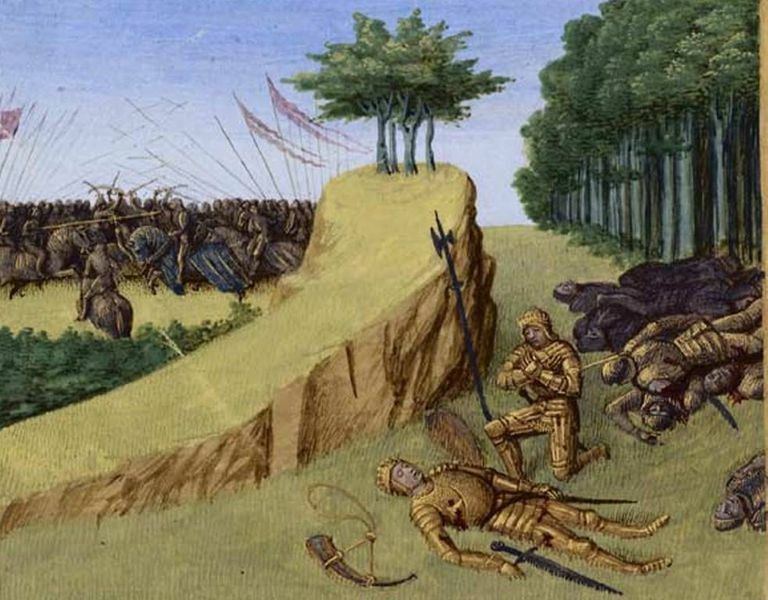 The Battle of Roncevaux Pass is also remembered as the inspiration for one of the oldest known works of French literature, the Song of Roland.